The exhibition shows the importance that numbers have had and have in all disciplines of knowledge and human affairs. "Since numbers appeared 5,000 years ago, even before the discovery of writing, humanity has become a very complex group of people, whose behavior is intented to be analyzed by means of algorithms based on an extremely large amount of data. The future of the humanity highly depends on the numerical values of some of the most important questions that await us." 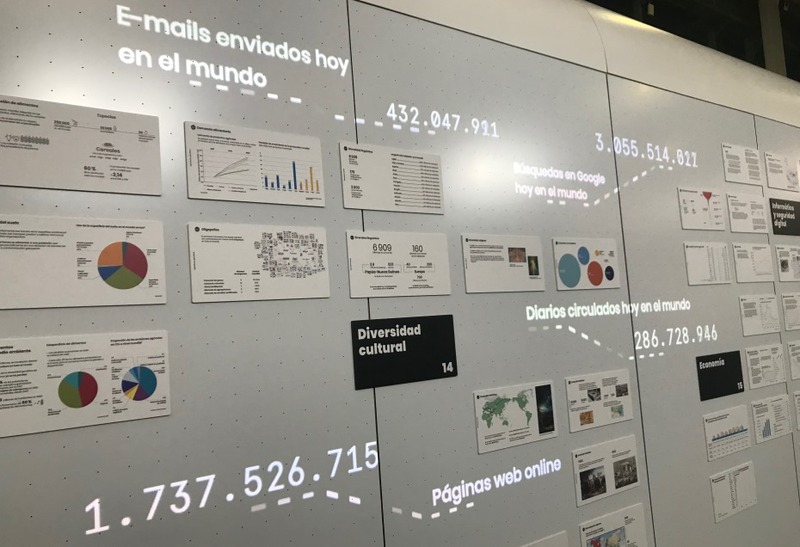 The exhibition includes thousands of curious data that are being updated in real time: the world population, the number of births this year, water and energy consumed, mobility, atmospheric pollution or poverty... and many more data that will make you aware of how humanity grows and evolves every second. It also includes data from more than 20 disciplines, including physics, chemistry, biology, energy, water, demography, crystallography, agriculture, cultural diversity, etc. Apart from emphasizing the role of numbers in all these disciplines of human knowledge, the exhibition wants to link the numbers with the content of the 17 objectives of sustainable development (ODS) of the United Nations. "Numbers and humanity" was seen from January 10 to February 7 2018 at the lobby of the Historic Building of the University of Barcelona (UB) and between 14-18 March 2018 at the "Saló de l'Ensenyament" in Fira Montjuïc. The idea is that this exhibition will travel around Spain during this year. The web version of this exhibition is also highly recommended. In it, the counters, and the data related to the Objectives of Sustainable Development and to the other 20 disciplines can be found, apart from other information related to the organizers and impact of the exhibition. There are also links to the news appeared in the newspapers or radio regarding the exhibition. Some of the newspaper articles are really worth reading! The exhibition has received funding from the Spanish Foundation for Science and Technology (FECYT) of the Ministry of Economy and Competitiveness, and the support of the Barcelona Supercomputing Center of the National Supercomputing Center (BSC-CNS), the AGBAR Foundation, Hewlett-Packard, the Spanish Network of the Global Partnership for Sustainability, Rhode & Schwarz, Sentilo BCN (Barcelona City Council), IDAEA-CSIC, the Esteyco Foundation and Volkswagen.